Press Release (ePRNews.com) - COLORADO SPRINGS, CO - Mar 16, 2018 - Virginia Phillips, Amazon bestselling author and entrepreneurial success coach, is offering a FREE copy of her book, for a limited time, through her website to say ‘Thank You’ and give back. Virginia Phillips has spent her career helping others achieve their dreams through entrepreneurship. Her coaching and mentoring have enabled many business owners to realize their full potential. Now, the bestselling author of Yes, You Can! Your Roadmap to Dream, Create, and Profit is extending this help to others by offering a free copy of her book through her website for a limited time. For a limited time, readers can obtain a FREE copy of Yes, You Can!, a $32 value, by visiting the website at www.bookyesyoucan.com. 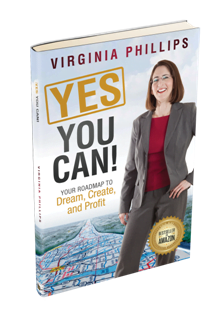 Virginia Phillips is a bestselling author, international speaker, and entrepreneurial coach. Her unique ability to build valuable relationships with others from a variety of backgrounds has made her a sought-after expert. She was awarded the VIP Woman of the Year Circle of Excellence Award for 2017-18 and was also nominated for the Best of Colorado Springs for 2018. For more information, visit www.AOEEnow.com.